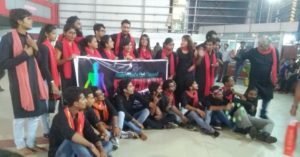 October, Patna: The crowd of the Patna Central Mall were arrested by the sight of two boys acting as a transgender and clapping around. They stood fixed by the amazing play written and directed by Nihal kumar Dutta, a third year Mass Communication student. Pehchaan was organized by Xavier’s Theatre club of St. Xavier’s College of Mgmt. & Tech., at Patna Central Mall, Frazer Road at 5:30 on Saturday evening. The theme of the play was empowerment for the Transgenders. The 10-minute play showed the perception and behavior of the society towards the Transgenders, the problems they face in their daily life. The play depicted the life of the Transgenders; it showed how the society boycott them, always taunt them and are denied from their fundamental rights. It showed that even parents abandon their child if it’s a transgender, school do not take admission of such children etc. people need them for blessing when a child is born or there is any other occasion of happiness but do not accept them as a part of the society. “The main idea based on which I wrote this play was that these Transgenders are also a part of our community but they are looked down upon by the society. 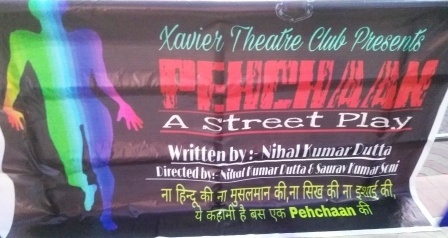 Once during my journey from Patna to Kolkata, I came cross them in the train, I observed them and my co-passengers’ reactions about them, from there the idea of this play pehchaan came to my mind” says the writer of the street play Nihal Kumar Dutta. “For the first time I was playing the role of a transgender, I was really nervous about my performance and how people will react on such issues. All that we want to convey through our play was that we all are made by God, the way we are is not in our hand so why this discrimination towards them they are also human and have the complete right to live a normal life” said Sourav Kumar Soni, one of the performers. Jaya, one of the visitors said “First I thought what they are doing but then I realized that yes we can change our mentality after all Transgenders are also humans like us. They also have the right to go to school and live their life like us”. In the play they talked about K. Prithika Yashini the first transgender sub-inspector of India and showed that if they are given equal chance and opportunities they can also prove themselves. The performers gave their best and urged people to be the change. The play ended with a very meaningful song sung by the performers, written by Shiv Nayan Prakash (a student of St. Xavier’s College of Mgmt. & Tech. and a performer as well) “maati maati mai maati maati tu” that meant that we all are made by god by the same soil so why is this difference.